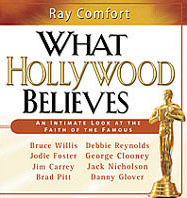 Find out the personal beliefs of some of the biggest names in Hollywood! You’ll learn the thoughts of Jack Nicholson, Jim Carrey, and Bruce Willis. You’ll find out what Brad Pitt said about a Bible story he heard in childhood. You’ll see what Danny Glover says about the other side, learn Jody Foster’s opinions about God . . . and find out what spiritual laws Debbie Reynolds says she lives her life by. This 50-minute evangelistic audio will keep you spellbound!